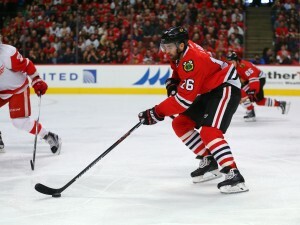 The Chicago Blackhawks did more than just lose a game in their February 13th contest with the Anaheim Ducks. In addition to the 3-2 defeat they suffered, star forward Marian Hossa also left the game with a leg injury that would keep him out of the Hawks lineup for the rest of February. Leery of breaking up his productive second line, coach Joel Quenneville rolled with a line of Jonathan Toews, Richard Panik, and Andrew Shaw to carry the load for his team up front. And after Stan Bowman pulled the trigger on a trade for former Winnipeg captain Andrew Ladd, the top line began producing once again. One of the biggest keys in maintaining that production was the play of Shaw in combination with Toews. The feisty winger had one of his best months of the season when he scored two power-play goals and seven points in eleven games, while Toews raised his game with nine points in ten games as well. Shaw’s puck retrieval and the strength of Toews seemed like a perfect combination, until Marian Hossa made his return to the lineup. At that point Shaw was bumped all the way back down to the team’s fourth line, where he has yet to record a point. All of this raises the question: did Quenneville make the right decision in limiting Shaw’s minutes and sliding him down to the last unit? Even though I have raised the question of whether or not Shaw should have been moved to the last line, I am not questioning whether or not he should have stayed on the team’s top line. Quenneville has three incredibly good players filling up the slots on that line already, and taking one off just doesn’t make sense at this time. The early returns for the new top line weren’t overwhelmingly positive in a bad loss to Dallas, but Toews, Hossa, and Ladd did combine for a +10 5v5 corsi differential according to war-on-ice.com. Additionally, Ladd has nine goals since the start of February, while Toews and Hossa have been regular line-mates for the past several seasons. Leaving any one of those three out of the mix for top minutes would be the kind of desperate move that the Hawks do not currently need to make. Assuming the top two lines are untouchable then for the Blackhawks, the third line is the sole available spot for Shaw to play on. He has played extensively there in the past, and his 31 points this season clearly suggest that he is more than a typical fourth-line grinder. However, the emergence of Teuvo Teravainen and the acquisition of Tomas Fleischmann make it unlikely for Shaw to crack the third line either. Dale Weise joined that pair against Dallas, and those three combined for a +22 5v5 corsi differential and accounted for both of Chicago’s goals in the contest. The former combination of Teravainen, Fleischmann, and Andrew Desjardins also recorded a 53.25 CF% in their time together according to Corsica.hockey. So even if Quenneville doesn’t offer Weise more praise than he did after the former-Canadien’s first game, Desjardins is still the more likely option to slide into that third-line role. Plus, the potential return of Marcus Kruger could mean the reformation of the effective shutdown line of Kruger-Shaw-Desjardins that was used for much of last season en route to a Stanley Cup. Rolling with four lines of the caliber discussed here could be enough to carry the Blackhawks to consecutive Stanley Cup victories and makes the team more balanced overall. Only time will tell if continuing to play Andrew Shaw on Chicago’s fourth line is a good idea. But given the plentiful options Quenneville has at his disposal right now, it’s tough to argue with the current lineup.